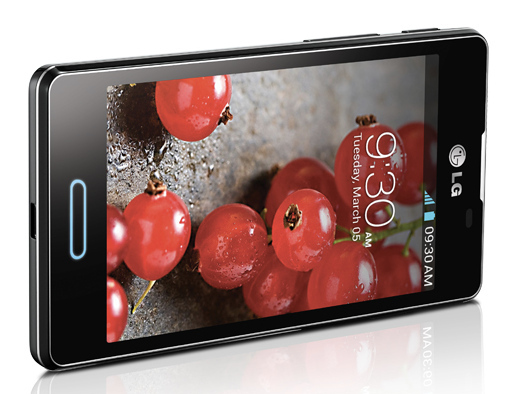 LG’s Optimus L5 II is targeted at entry-level smartphone users, and boasts all the features and specs users of this pricing segment expect. The feather in its feature cap though is most definitely the display, but is it enough to justify the smartphone’s R2k pricetag? The Optimus L5 II comfortably slides into even the tightest of skinny jeans and nestles neatly in your palm as though your hand was designed for the sole purpose of cradling this new bundle of smartphone joy. We are fans of the 4.3" (480 x 800 pixels) IPS LCD capacitive touchscreen of the Optimus L7 II (review) thanks to its excellent viewing angles and good colour saturation. The Optimus L5 II kicks this up a notch due to offering the same resolution and screen technology across a slightly smaller iPhone-esque 4" of screen real estate. This means that the pixel density is actually higher in the case of the cheaper L5 II (233 ppi) than its mid-range sibling’s 217 ppi. A pixel density of 233 ppi is not to be sneezed at this price point with the IPS display also delivering excellent viewing angles and good colour saturation. Android 4.1.2 (Jelly Bean), along with LG’s Optimus UI skin handles the operating on this smartphone. Although the Optimus L5 II has less added functionality compared to the midrange L7 II and top end Optimus G (review), users do receive QuickMemo and Cheese Shutter. Cheese Shutter allows users to capture photos simply by saying preset phrases such as “cheese” or “LG”. This is handy for capturing selfies since the L5 II lacks a front-facing snapper. Photo quality with the L5 II’s 5 MP camera is pretty average, whilst videos are recorded at an unimpressive VGA resolution. QuickMemo enables you to quickly jot down notes such as a phone number or an address on the smartphone’s screen by using your finger as a stylus. These notes can then be saved or shared across social networks, in an SMS or e-mail. This feature is made easier via the QuickButton which is located above the volume rocker on the left side of the L5 II. By default this button launches LG’s QuickMemo app, but users can change this button to launch another app like WhatsApp or Google Maps for turn-by-turn, voice-guided navigation. Navigating Android is kept smooth thanks to the L5 II’s MTK 6575 chipset, which pairs a PowerVR SGX531 GPU and 1 GHz single-core CPU. This chipset is assisted by just 512 MB of RAM, which translates to lag rearing its ugly head every time one runs multiple apps simultaneously. Also onboard the L5 II’s feature train is FM radio with RDS, HSDPA connectivity offering download speeds of up to 7.2 Mbps and upload speeds up to 5.76 Mbps, dual-band Wi-Fi 802.11 n, and Bluetooth v3.0 with A2DP. Thanks to the L5 II’s 1700 mAh Li-Ion battery, the smartphone managed to last an average 11 hours on a single charge, meaning it is able to stay charged for a full working day at least, provided you keep the screen brightness at 65% or less. LG’s Optimus L5 II packs some run-of-the-mill specs but ups its value offering game thanks to some handy features that includes Cheese Shutter and a very decent (for this price point) display. It goes for a recommended retail price of R2 000, pitting the device against the likes of Nokia’s Lumia 520 (review) which delivers more spec bang (dual-core Snapdragon CPU) for less money (R1 900). If you simply need a new entry-level smartphone costing in the region of R2 000 or want something different to Android, the Lumia 520 is a better bet, but if you are an apps addict or simply can’t switch from Android then the L5 II will cover all your smartphone basis. Great screen for the price range. Some value added software features from LG. Light design that is comfortable to hold and easily slips into any pocket. Single-core CPU and half a GB RAM do not allow for blistering multitasking performance. No real wow factor in the design. VGA video recording quality only. Great screen for the price range; voice activated pictures; some value added software features from LG; affordable; and light design that is comfortable to hold and easily slips into any pocket. Single-core CPU and half a GB RAM do not allow for blistering multitasking performance; no real wow factor in the design; average camera performance; no front-facing snapper; and VGA video recording quality only.